Clean and wash chicken. Add 2 teaspoons ginger garlic paste, haldi and lemon juice. Mix well and leave it aside for atleast half an hour. Heat oil in a pan. Add cloves, cinnamon and bay leaves. Add the chopped onions and fry until the onions turn translucent. Now add the ginger garlic paste. Fry for few sec. and add red chilli powder, haldi, dhaniya powder. Stir fry and add the marinated chicken to it. Cook for 4 to 5 mins in a medium flame. Add the chopped potatoes and salt to taste. 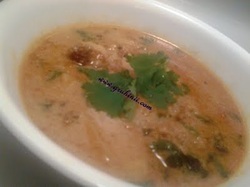 Cook for 4 to 5 mins in a medium flame and add the ground khas khas, kaju coconut paste. 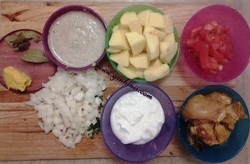 Add a cup of water, close the lid and cook until the chicken and the aloo becomes tender.